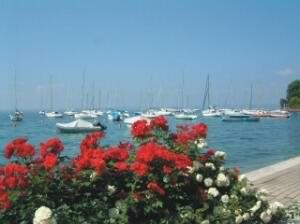 "New to Lake Garda? Discover where to stay on the lake.... "
If you have never been to Lake Garda before, then deciding where to stay can be a little tricky. The north and south parts of the lake offer quite different experiences and therefore it really depends on what you want to do when you get there. The North part is very mountainous and steep with loads of more extreme sporting activities. The south is much flatter with gentle slopes, larger beaches and is better for just relaxing by the lake. Where the lake goes from the wider south part to the narrower north part is where the landscape turns really mountainous. The South part of the lake has a 'mediterrainean' feel to it with more extensive beaches and slightly hotter temperatures. If you prefer lounging by the lake and are into leisurely activites like golf, then we suggest you stay at one of the Lake Garda accommodations on this part of the lake. There are a lot more campsites at this end of the lake too. It's also great for children, as there are various themeparks and attractions... Gardaland being one of the most popular. The South is within easy reach of the major airports. Another bonus is you can go on exciting excursions to places like Verona or Venice very easily because they are far quicker to reach from the bottom of the lake (where there are major road and rail links). And the landscape? At the south of the lake it's much more gentle with rolling hills...these then gradually rise up to meet the mountains from the north as you go towards the middle of the lake. The North part of the lake is very mountainous and dramatic with spectacular scenery! If you want to do things like rock climbing and surfing, then the North is probably the best for you...most mountain and water sports are done here. boats is restricted in the North. It is a little bit more restricted travelling around the top of the lake but the awesome views more than make up for this. 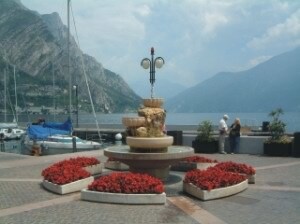 The north end of the lake can be a bit breezier (which is why Torbole and Riva are so popular for windsurfing) and is usually a couple of degrees cooler than the south. Click here to go from where to stay back to the accommodation page.